The UCSF Center for Community Engagement supports a range of education and training initiatives that strengthen UCSF’s work improving the health of all the communities it serves. Whether we are ensuring that UCSF students learn essential skills in community settings, or planning and managing efforts to make UCSF a more familiar and welcoming place to learn, receive health care or conduct research, the CCE is a resource for maximizing health and other benefits of community engagement and partnership. Service learning is a structured educational experience that combines community service with explicit learning objectives, preparation and reflection. 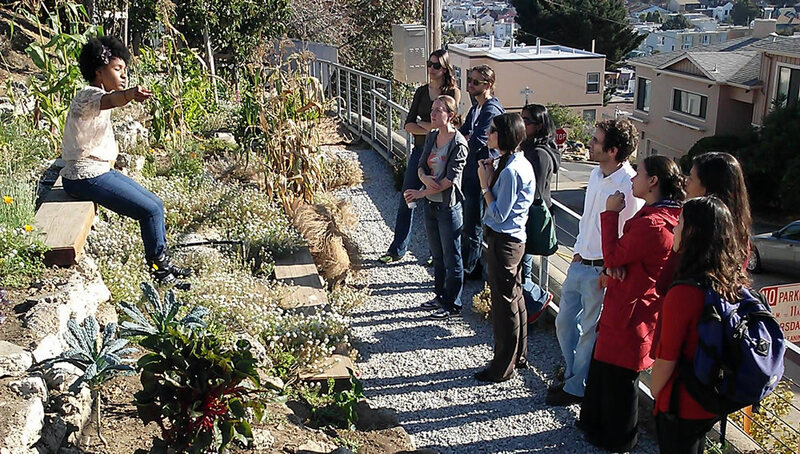 Across all four schools and the graduate division, UCSF offers service learning opportunities to engage locally, regionally, and on a national and global scale to improve health and promote health equity. Successful service learning is a reciprocal process that benefits both community and campus partners. Partners equally share expertise, resources and leadership. Sometimes known as community-engaged scholarship, stakeholder engagement, community-partnered research, or civic engagement, service learning provides support to community health improvement and equity efforts while building learners' skills to address the integral ties between health and social, economic and cultural context. Differences Matter: An institution wide initiative with a focus on establishing UCSF as a destination for those seeking to eliminate educational opportunity disparities in our communities. Regional Collaboration to Strengthen and Expand STEM (RECESS): A collective impact pilot initiative of cross-sector organizations to align efforts across the San Francisco and Alameda Counties with the goal of broadening participation in Science Technology Engineering and Mathematics (STEM) education and careers for women, African Americans and Latinos. We believe in the potential for developing effective and impactful interventions and policy, particularly when we develop a balance between evidence and community perspectives. Research helps us understand what has worked or not, given a rigorous examination of work in other settings or at different times. Community perspectives help us understand what will work best now in a particular setting and time, from someone with "insider" expertise. Bringing the two perspectives and experiences together can offer us a powerful approach to reducing disease, especially when we take into account the perspectives of populations disproportionately burdened by that disease. For Community: Our program helps build the capacity of our partners to better use science and research to get your work done. Some examples include: how to use existing evidence to design an evidence-based program or policy; how to design an evaluation of your program impact; and how to partner with scientists to do research in your community. For Faculty & Staff: Our program helps build the capacity of our faculty and staff to better partner with civic agencies, policymakers, community-based organizations and others to leverage our skills and science expertise in mutually beneficial and impactful relationships. Learn how partnering with communities burdened by disease can help you reduce disease burden in those communities, and enhance the power of your intervention. These UCSF programs require learners to complete all elements of service learning activities for successful completion of their training.